Regional politician Arne Liaklev doesn’t want the snowy, wind-swept coast of Finnmark to be the next playground for big oil. “Too risky for the Arctic environment,” he argues. The Norwegian Government plans to award 54 blocks in the Barents Sea to different oil companies before the summer. For Arne Liaklev, a County Parliament member for the Green Party in Finnmark, the logic of opening the waters in the high north for oil drilling is difficult to understand. “The Barents Sea is the last frontier. Here, nature is extreme and ecosystems are very vulnerable,” he argues. Oil firms don’t see it that way. 26 companies have submitted applications to the Ministry of Petroleum and Energy for new exploration acreage in Norway’s 23rd licencing round on the continental shelf. This round is the first where the south-eastern part of the Barents Sea is opened up. “It is encouraging that so many companies have submitted applications,” Minister of Petroleum and Energy Tord Lien says. This is also the waters where Norway has its maritime delimitation line with Russia, a sea border that were finally settled in 2010 after being disputed between the two countries for forty years. Norway immediately started shooting seismic in the area. Those days, the price for a barrel of oil climbed sharper than edges of the peaking mountains in Norway’s beautiful Lofoten archipelago, another area in the north Minister Lien wants to open for oil drilling. Arne Liaklev uses economy when arguing against big oil in Finnmark. 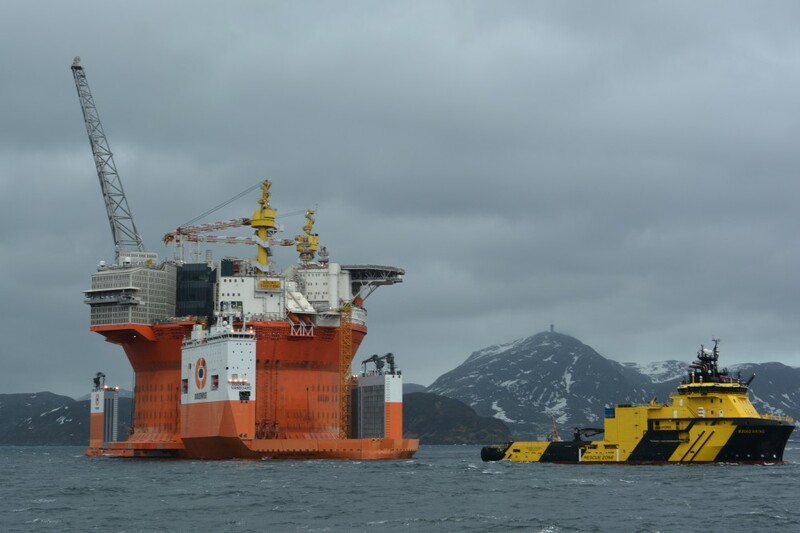 Eni Norge has experienced the high costs. The hard way. Goliat drilling platform north of Hammerfest in the western part of the Barents Sea had an original budget of 32 billion kroner (€3,36 billion). Being delivered last winter from the yard in South Korea, the overruns were nearly 50 percent, 16,6 billion kroner more. If the final price tag will be today’s 48,5 billion kroner (€5,08 billion) is maybe early to conclude. Production has not yet started. The 64-thousand-ton platform is the world’s largest offshore rig, specially designed to resist ice and the harsh polar climate. “Goliat will never make money,” says Liaklev well aware the oil price just fall below €30 per barrel. “Drilling for oil in such environmental sensitive area as the Barents Sea is short-term thinking,” says Arne Liaklev. He points to the large bio-resources in the area, being well managed jointly by Norway and Russia for hundreds of years. The Barents Sea is today one of the most important fishing grounds in the world, with well kept stocks of spices like Arctic cod and no pirates overfishing the quotas. Arne Liaklev admits that it is difficult to protest big oil. The industry promises employment, economical growth and welfare. In a period of time when Norway’s unemployment is on the rise and the confidence in economy drops, wealthy oil businesses are lucrative hopes. Also in the High North. “Many politicians says ‘It is our turn now here in Finnmark’ – pointing to the south were Norway’s oil wealth have brought big money and healthy municipal budgets,” Liaklev explains. Just before Christmas, the Norwegian Oil and Gas Association presented a study claiming that each Norwegian would have to pay 52,000 kroner (€5,460) more in annual tax if all oil and gas activities were stopped. Norway sure is an oil-depending economy. For Arne Liaklev, oil drilling in the Barents Sea is not the answer for Finnmark’s future. “Especially when I meet people living along the coast, in the fishery communities, they understand. Fish and marine resources is what we have and what we should build further on,” Liaklev says. At the recent UN Conference on Climate Change in Paris, scientists told world politicians that burning fossil fuels is melting the Arctic. They warn that oil deposits beneath the seafloor in the Arctic, like the Barents Sea, must remain buried if the planet is to have any chance of avoiding catastrophic climate changes. Arne looks out in the waters and discovers that the fjord outside Kirkenes is freezing. Sea ice is less common nowadays, he says.